Search for and order (almost) any book! 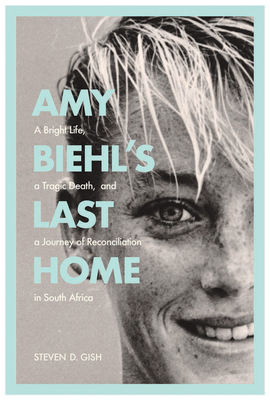 In 1993, white American Fulbright scholar Amy Biehl was killed in a racially motivated attack near Cape Town, after spending months working to promote democracy and women’s rights in South Africa. The ironic circumstances of her death generated enormous international publicity and yielded one of South Africa’s most heralded stories of postapartheid reconciliation. Amy’s parents not only established a humanitarian foundation to serve the black township where she was killed, but supported amnesty for her killers and hired two of the young men to work for the Amy Biehl Foundation. The Biehls were hailed as heroes by Nelson Mandela, Desmond Tutu, and many others in South Africa and the United States—but their path toward healing was neither quick nor easy. Steven D. Gish is a professor of history at Auburn University at Montgomery. His previous books include Alfred B. Xuma: African, American, South African and Desmond Tutu: A Biography. He has traveled widely in South Africa since the 1980s and has interviewed key figures in the antiapartheid movement, including Nelson Mandela, Walter Sisulu, Desmond Tutu, Trevor Huddleston, and Beyers Naudé. is the person behind The Snail. Click to let her help you find books you love.